An organization’s best advocates are its employees; but to be great advocates for their organizations, employees must understand what they’re advocating, and want to spread the word. This starts with open and engaging dialogue and demonstrating to employees that they have a voice, and their voice matters. And with social media having such a transformative effect on the way people connect with each other, share insights, and champion what they like outside the office, why should it be any different inside the office? Now is the time to embrace this opportunity and redefine how we communicate internally. Moving internal communications from a top­-down, one­-way model to an employee­-centric approach complements in­-person experiences with both traditional and digital channels. The end result is a framework that not only informs, involves and inspires, but builds a community of happy and engaged employees. In our executive guide, Creating Employee-Centric Internal Communications, we provide a digestible, four-step approach. 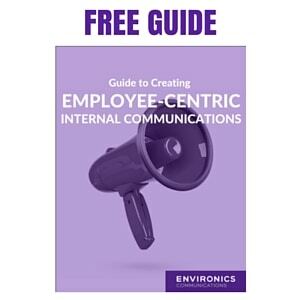 If you’re looking to implement an employee-centric internal communications model, this is your ultimate guide.